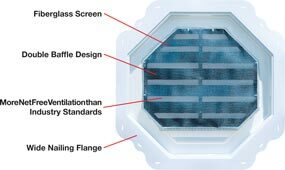 Mid-America Gable Vents offer key features that have become the benchmark in the industry. Installation is easy with our wide nailing flange, leveling lines, adjustable stop gauge and snap-on trim ring. 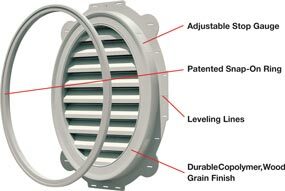 Our patented snap-on trim ring hides rough cuts and reduces installation time, while providing a finished appearance once the vent has been installed. Each of these vinyl gable vents has more Net Free Ventilation Area for optimal venting than industry standards. It’s backed by a (Limited Lifetime) warranty too! Mid-America gable vents provide added architectural detail with their wood grain finish and sharp distinctive features. Choose from the most styles, sizes and colors in the industry to accent your home beautifully. Our available paintable options allow for personalized custom gable vents. These vinyl gable vents are easy to paint with a primer and acrylic paint. Installation is easy on all types of siding including vinyl, wood, fiber cement, stucco, brick or stone. Our gable vents work well in both new construction and remodeling applications. You also have the option of installing vinyl gable vents with a decorative application, when a functioning vent is not required you can install the vent over a substrate without cutting a vent hole. Mid-America gable vents feature a double baffle design that blocks a direct view into the home and provides added protection against wind-driven rain and snow. The sealed-in fiberglass screen offers complete insect and animal protection.